Our sleigh rides can be used without snow because our horse drawn sleigh's have wheels on them so they can be used in the Phoenix Scottsdale area where its nice all winter long. Perfect for holiday parties or neighborhood tours. How about sleigh rides around your community to see Christmas lights and neighbors. Our no snow needed sleigh rides are pulled by a horse for the perfect holiday experience. 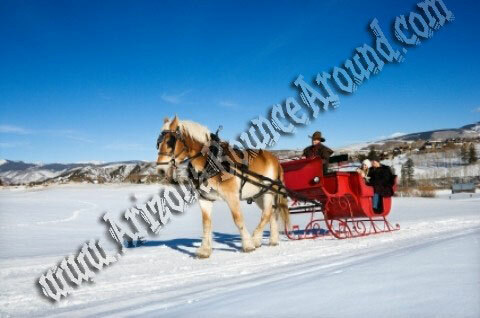 Have real sleigh rides at your company party to make it a fantastic experience for your employees and their families. Great for photos, Facebook and video opportunities. Our sleigh rides are priced at a 2 hour minimum so no discount for shorter rental times. We rent snow machines and many other holiday party rental needs like tables and chairs, propane heaters, Stage and dance floors, Frozen Margarita machines and more. Not to mention being a leader in kids entertainment rentals. No Snow Needed Sleigh Rides for hire in Phoenix AZ. We are your holiday party rental super store with real sleigh rides. Our no snow needed Sleigh rides are perfect for company holiday parties or riding around the neighborhood with friends.